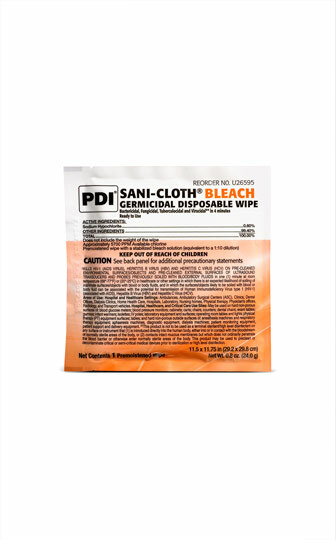 Individually wrapped wipes measuring 5" x 7" with a 1:10 bleach dilution. Ideal for disinfecting high risk areas endemic with Multidrug Resistant Organisms, Clostridium difficile spores and Norovirus. Meets CDC, OSHA and CMS Tag F441 guidelines. Bactericidal, Fungicidal, Tuberculocidal, Virucidal. Compatible with a broad range of surfaces and equipment in healthcare. 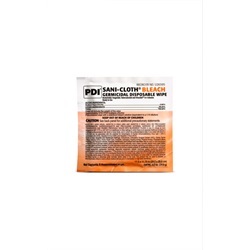 For use when taking a pathogenic specific approach to disinfection. Comes 40 wipes per box and 10 boxes per case.